The stable, roomy and comfortable seat for getting around with your kid. The Yapp Maxi Easy fit is perfectly suited for bikes with a sturdy rear rack. The Easy fit is a version of the Yapp Maxi with an alternative fitting system, by which the seat is attached to the bike's own rear rack. This gives your bike a great clean look. Easily mounts on bike's sturdy rear rack with Easy fit adapter - sold separately. Award-winning product: Baby Innovation Award Winner 2011, Reddot Design Award Winner 2009, Good Industrial Design Winner 2009 and 2010, Dutch Design Award 2009, Fiats Innovative Award 2009, Euro Bike IF Award 2011, Tank Award 2012, Mom's Best HOT Product Award 2012, National Parenting Center Seal of Approval 2012. 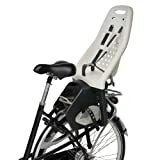 If you are having trouble finding the right seat for your bike please go to http://www.aikatrading.com/yepp/yepp-seatfinder/for a diagram that directs you to the right seat for your bike and child. The Yapp Maxi Easy fit is suitable for carrying children up to a maximum of 22 kg/48 lbs.